In 2017 a team of forward-thinking leaders at EllisDon introduced the idea of hosting an Emirati student from the Middle East by providing them with an internship position in Canada. As EllisDon’s presence in the region has grown, and continues to do so, it was a way to solidify its close ties to its local partners, while also establishing relationships with new ones. That summer the idea came to fruition with the first student taking part in the Emirati Internship Initiative. 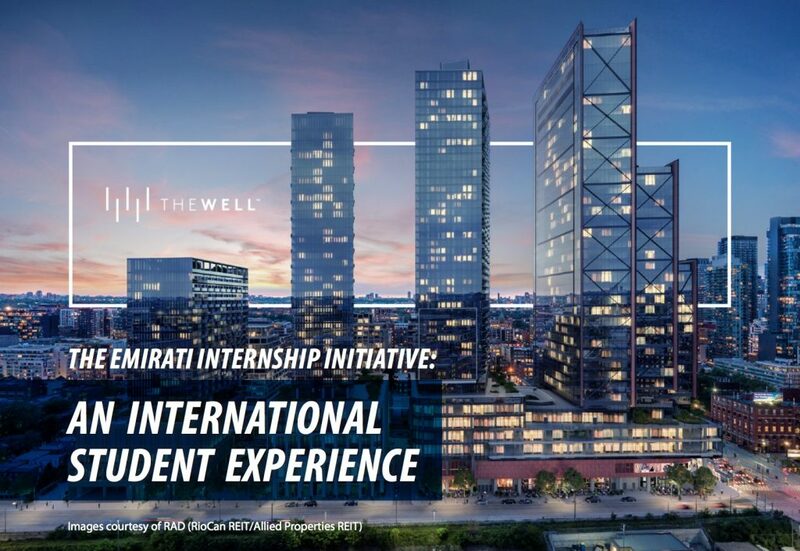 The Emirati Internship Initiative is a program that provides students from the Middle East region with opportunities to gain work experience with Canadian companies through the support of the Canada-UAE Business Council and the UAE Ministry of Education. As a result of the program, both EllisDon and the student involved experienced tremendous success. Building on the momentum of the first Emirati internship, EllisDon recently partnered with Khalifa University in Abu Dhabi to offer a position to an engineering student looking to gain international work experience. Following a competitive interview process among numerous exceptional candidates, a Field Engineer position was awarded to Fatima Alfalasi, a fourth year Civil Engineering student. From the very beginning Fatima was part of EllisDon. Following an orientation and introduction to her site team at The Well project, located in downtown Toronto, she immediately felt integrated with the company and her colleagues. Over the course of the eight week internship Fatima was actively involved on the project through meaningful work and contributions she was able to make. Fatima worked in various capacities where she was able to apply her knowledge in a practical setting, learn new skills, and overcome challenges, all with the full support of her site team and resources throughout the company such as EllisDon’s People and Culture department. EllisDon is pleased to announce that two more Emirati students from Khalifa University will be hosted for Summer 2019. As the success of the Emirati Internship Initiative continues to grow, EllisDon is looking ahead to engaging more Canadian companies to take part in the program so that more international students have the opportunity to work in Canada.